European honey bees were introduced to Fernando de Noronha Island in 1984 already infested by Varroa destructor, and since then they have survived without any control measures. In 2012, adult and brood infestation rates were measured and compared to historical records. There was no significant difference in mite levels between the values obtained in 1996 (14 mites/100 adult bees) and 2012 (16.5 mites/100 bees). The percentage of mites that reproduced in worker brood cells also was not significantly different from the data obtained in 1996. The frequency of hygienic behavior was similar to data obtained for resistant African-derived honey bees. Average fecundity decreased slightly between 1996 and 2012, but remained high. From our data, we conclude that those bees have maintained stable infestation levels for at least 16 years. Infestation rates remain high, at rates that would be fatal to honey bees in most regions of the world, but there is no Varroa-related colony mortality on the island. Varroa destructor is considered one of the main problems for apiculture worldwide, especially in temperate climate regions (De Jong et al. 1982, 1984; Moretto et al. 1991; Moretto 1997; Rosenkranz and Bartalszky 1996; Rosenkranz et al. 2010). Varroa spreads viral diseases within the colony (Chen and Siede 2007; Dainat et al. 2011) causing a host of issues, including development of malformations and reduced colony performance (Chen et al. 2004; De Miranda et al. 2010; De Miranda and Genersch 2010; Mockel et al. 2010; Santillán-Galicia et al. 2010; Yañez et al. 2011) that can ultimately lead to colony failure. Chemical control of Varroa is often expensive and problematic for many reasons. Issues related to contamination of bee products (e.g., honey and wax), development of resistance by the mites, and side effects caused by acaricides applied to control this mite are common (Milani 1999; Bogdanov et al. 1998; Wallner 1999; Sammataro et al. 2005; Berry et al. 2013). The worst side effect of chemical control, however, may actually be the removal of selective pressure on treated colonies, allowing less tolerant colonies to produce males and possibly maintaining this trait of susceptibility for subsequent generations (Fries and Camazine 2001; Locke and Fries 2011). Of the eight original known haplotypes (with distinct mitochondrial mtDNA sequences) of V. destructor found on Apis cerana, only Japan 1 (J1) and Korea 1 (K1) have successfully switched to Apis mellifera (Anderson and Trueman 2000; Zhou et al. 2004; Solignac et al. 2005). The Korean haplotype is frequently described as more virulent and tends to be predominant in unbalanced host–parasite systems, like those that exist in Europe and North America, where current treatments have varying levels of success and tolerant lines of bees are uncommon. In more stable host–parasite systems, such as in Brazil, the Japan–Thailand haplotype formerly predominated (Anderson and Trueman 2000; Garrido et al. 2003). However, recent studies demonstrated that in Brazil the Japanese haplotype is now restricted to Fernando de Noronha Island, and on mainland Brazil the Korean haplotype is currently predominant (Guerra et al. 2000; Strapazzon et al. 2009). Various populations of free mating honey bees have been reported as naturally V. destructor-tolerant. 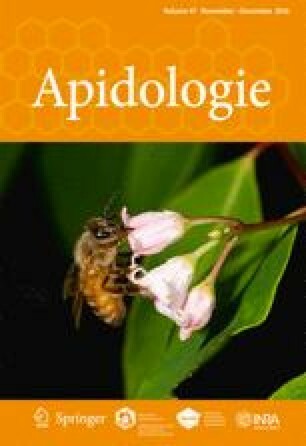 The most well-known and documented Varroa-tolerant populations are the African strains and their hybrids, also known as African-derived honey bees (AHB) (De Jong 1996; Eguaras et al. 1995; Guzman-Novoa et al. 1999; Martin and Medina 2004; Medina and Martin 1999; Mondragón et al. 2006; Moretto et al. 1991; Rosenkranz et al. 2010; Rosenkranz and Engels 1994). The European honey bee (EHB) is generally more vulnerable to Varroa infestation, but some populations have also been described as resistant/tolerant (Kefuss et al. 2004; Seeley 2007; Locke et al. 2012). Fries et al. (2006) described a honey bee population that survived without Varroa treatment for 7 years in a Nordic climate area. Fries and Bommarco (2007) and Locke and Fries (2011) determined that resistance resulted from the colonies limiting brood rearing as an adaptive response to mite parasitism pressure, which in turn reduced Varroa reproductive success and population growth. In France, another strain of bees was described as an 11-year-treatment-free survivor (Le Conte et al. 2007). Locke et al. (2012) concluded that this population has also developed resistance traits able to reduce the fitness of the mite (measured as reproductive success). An Eastern Russian strain of bees, known as “Russian” or “Primorski,” is also considered to have enhanced Varroa tolerance, in this case due to a long period of coexistence (De Guzman et al. 2007; Rinderer et al. 2000, 2001; Rosenkranz et al. 2010). Kefuss et al. (2004) described a population of Apis mellifera intermissa bred for hygienic behavior that survived mite infestations. Other breeding efforts have also had some success based on selecting colonies with low infestation rates and suppressed mite reproduction (Spivak 1996; Spivak et al. 2003; Harbo and Harris 2005, 2009; Ibrahim and Spivak 2006; Harris 2008; Rinderer et al. 2010). Most notable among these is the Varroa Sensitive Hygienic line (VSH), which removes Varroa-infested pupae from capped brood at a high rate (Harris 2008). Hygienic behavior is defined as a honey bee’s ability to detect, uncap, and remove brood already dead or infected with bacteria (Paenibacillus larvae) or fungi (Ascosphaera apis) before the pathogens sporulate (Woodrow and Holst 1942; Rothenbuhler 1964; Spivak et al. 2003). Hygienic worker bees also uncap and remove a portion of brood infested with the parasitic mite V. destructor (Boecking and Spivak 1999; Spivak 1996; Spivak et al. 2003). However, this is only one aspect of natural resistance; some colonies and developing larvae and pupae have other attributes that could contribute to reducing mite reproductive success (Garrido et al. 2003; Milani et al. 2004; Locke et al. 2012). We re-examined a honey bee population that was first described as Varroa-tolerant in 1996 (De Jong and Soares 1997). De Jong and Soares reported an Italian honey bee population, Apis mellifera ligustica, surviving Varroa infestations on Fernando de Noronha Island in Brazil. The bees were originally introduced to the island (about 540 km offshore) in 1984 in order to provide EHB stocks for Brazilian beekeepers (Malagodi et al. 1986). No chemical treatment or specific management for mite infestation control has ever been applied. We re-examined the Varroa infestations in the EHB colonies on Fernando de Noronha, after 15 years, to determine if they maintained their tolerance to this mite and also to investigate possible resistance mechanisms that could account for this effect. On the island of Fernando de Noronha, Pernambuco state, Northeastern Brazil (3° 50′ 47.5″ S; 32° 25′ 40.8″ W), infestation rates of colonies of A. mellifera ligustica that have naturally survived without Varroa treatment or any other kind of infestation control were measured. All colonies are managed following normal practices, by the islanders, in standard (Langstroth) equipment. Fifteen colonies with one hive body (brood chamber) and at least one shallow super were used throughout this study conducted in November 2012. The data was compared to the data presented by De Jong and Soares (1997) in order to allow a more detailed conclusion about Varroa infestations on the island. As in the previous investigation, the assays were performed in November. Samples of bees from brood combs of standard colonies were collected from each hive. The methodology described by Stort et al. (1981) was used in order to obtain an infestation rate of adult bees. Approximately 150 bees per colony were collected from brood frames in plastic jars half filled with a 92 % aqueous ethanol solution. The sample jars were then shaken manually for 2 to 3 min to loosen mites attached to the bees. Next, the samples were filtered through an 8-mesh screen (with openings about 3 mm across) and onto a white cloth to separate mites and bees following standard protocols (De Jong et al. 1982). The methodology was repeated three times for each colony to allow calculation of an average infestation rate. Varroa infestation rates of worker and drone brood were obtained by determining the percentage of brood cells that contained live Varroa mites, based on the methodology used by De Jong and Soares (1997). We uncapped developing bee pupal cells at approximately 18 days old for worker brood and 21 days for drone brood and counted the number of mites in each cell. All colonies were examined at least twice for an average estimation, totaling 100 worker and 60 drone brood cells from each colony. An estimation was made by calculating the number of live Varroa progeny per adult female mite in all the brood cells that we analyzed. Fifty worker pupae and 30 drone pupae brood cells were uncapped and analyzed; this procedure was repeated at least twice in each colony. We also calculated the mean number of live Varroa progeny in drone brood cells infested with one, three to four, or five to 13 adult female Varroa mites. Hygienic behavior tests were conducted following the methodology described by Newton and Ostasiewski (1986) and then modified by Gramacho and Gonçalves (1994). Briefly, capped pupae were pin-killed and the posterior removal of those dead pupae performed by worker bees was recorded after 24 h. For a comparison to another population, ten colonies of AHB in Ribeirão Preto, in southeast Brazil, were also tested for hygienic behavior with the same methodology. The t test was used to compare the descriptive statistics obtained in 2012 and in the data from 1996. The data was first analyzed for normality. Analysis of variance (one- and two-way) and the Tukey test were applied for other comparisons. The Mann–Whitney test was applied to non-parametric data. All statistics were analyzed with JMP® Pro v10.0 (SAS, Cary, NC) with α = 0.05. The data concerning the infestation rates observed in adults and developing bees met the normal statistical distribution requirements (Kolmogorov–Smirnov test 0.069; df = 44; P = 0.200; Shapiro–Wilk test 0.963; df = 44; P = 0.174). Observing the data collected along the last 21 years, we notice an initial marked decrease in infestation rate (1991–1996), followed by a subsequent (1996–2012) stabilization (Figure 1). In 2012, the average adult bee infestation rate of colonies was 16.5 mites per 100 bees (S.D. = 7.3), compared to over 25 mites per 100 bees in 1991 (Figure 1). The infestation rate in 2012 was not significantly different from the mean reported in 1996 (14.0 ± 5.3) (t = 1.184; P = 0.122; df = 33). Mean Varroa infestations on adult worker bees (mites per 100 bees ± standard deviation) in colonies on Fernando de Noronha Island, during 21 years. Upper bars indicate standard deviation. The data for 1991, 1993, and 1996 are from De Jong and Soares (1997). The brood infestation rate in 2012 was 22 % (±11.8) in worker brood (Figure 2). When we examined drone brood infestation, 43.5 % (±14.3) of the brood cells were infested by Varroa. There was no significant difference when compared to data obtained in 1996 (worker brood infestation 1996 vs 2012: t = 0.802; P = 0.216; df = 17; drone brood infestation 1996 vs 2012: t = 0.793; P = 0.219; df = 16). a Mean rate of brood infestation (number of adult Varroa mites per 100 brood cells) in worker (WB IR) and drone brood (DB IR) registered in 1996 and 2012. b Average fecundity of Varroa destructor in worker (AFW) and drone brood (AFD) registered in 1996 and 2012. Upper bars indicate standard deviation. t test: a P = 0.21; b P = 0.21; c P = 0.22; d P = 0.04. Data for the year 1996 is from De Jong and Soares (1997). The average fecundity was also tested in worker brood; we found live Varroa progeny in 76.4 % (±13.6 %) of the worker brood cells. A comparison between data collected in 1996 and 2012 showed no significant difference (t = 0.760; P = 0.228; df = 18). However, in drone brood cells, average fecundity was significantly lower than that found in 1996 (Figure 2b; t = 1.862; P = 0.040; df = 16). The mean number of live Varroa progeny produced per drone brood cell was 2.78 (±0.59) when there was one original adult female mite. The number of Varroa progeny per original adult female was reduced significantly when three or four original adult female mites were found per drone brood cell (mean = 0.31; S.D. ± 0.32). The number of progeny produced per original female mother was even lower when five or more adult female mites were found (mean = 0.21; S.D. ± 0.30). These differences were significant (ANOVA among treatments: F = 154.68; P < 0.0001; and the Tukey test) (Figures 3 and 4). Hygienic behavior (removal of pin-killed pupae after 24 h) observed for European honey bees in Fernando de Noronha (EHB FN) and Africanized honey bees in Ribeirão Preto (AHB RP). Lower bars represent standard deviation. Mean number of live progeny produced per original invading female mite in drone brood cells by one, three, or more (≥3) and five or more (≥5) adult female Varroa mites. Upper bars indicate standard deviation. ANOVA among treatments: P < 0.001. Different letters indicate a significant difference (Tukey test, P < 0.05). In the hygienic behavior test, 80 % of the colonies tested in Fernando de Noronha had a relatively high level of hygienic behavior (greater than 80 % of dead pupae removed within 24 h). The mean score for hygienic behavior average was 85.7 (±19.8). The data concerning hygienic behavior did not meet the normal statistical distribution requirements (Kolmogorov–Smirnov test 0.194; df = 20; P = 0.047; Shapiro–Wilk test 0.876; df = 20; P = 0.015), so non-parametric statistics were used for comparisons. The performance of the EHB colonies on Fernando de Noronha was close to that observed for AHB in Southeast Brazil. The mean AHB hygienic performance in Ribeirão Preto was 93.9 % (±5.7 %). The values for the two types of bees did not differ significantly (Figure 3; Mann–Whitney U = 44; P = 0.676). Beekeeping activity in Fernando de Noronha has maintained a strictly amateur “let alone” profile, with no breeding improvements or chemical treatments applied so far. The main goal of beekeepers on the island is the harvest of honey, for tourist sales and for self-consumption. Thus, the survival of the colonies observed during these 30 years is probably due to natural mechanisms developed due to the host/ectoparasite interactions. No indication of colony mortality was observed during our visits (this paper and De Jong and Soares 1997), nor was it reported by the beekeepers. Horns and Hood (2012) discuss the differences between resistance and tolerance. They state that resistance can be attributed to hosts/traits that reduce the harm caused by pathogens/parasites, by preventing infection/infestation. Tolerance, in turn, involves traits that do not inhibit infection/infestation, but instead reduce its negative consequences by reducing mortality or restoring fecundity of infected/infested hosts (Roy and Kirchner 2000; Miller et al. 2005). Resistance and tolerance both can increase the fitness of an infected host, but resistance does so by necessarily limiting pathogen fitness, whereas tolerance does not. By that definition, we may consider the population of Fernando de Noronha to be tolerant to the Varroa present on the island, since those bees are infested by the mites but do not present weakening symptoms or collapse records. Some Varroa-tolerant populations of EHB have been found to maintain small colonies throughout the year, with little honey production, usually reducing brood production, possibly to maintain lower rates of mite reproduction and infestation (Locke et al. 2014). In contrast, the European bee colonies on Fernando de Noronha maintain large populations throughout the year and produce considerable honey (unpublished observations). Given that the infestation data collected in 2012 were similar to those found in 1996, it appears that V. destructor infestation rates have been stable over the last 16 years in the EHB colonies on this island. Based on our results and that of previous work on this population, we presume that the observed tolerance to Varroa infestations could be attributed to several potentially non-exclusive mechanisms that include climate, ectoparasite haplotype, incidence/diversity of pathogens, and mechanisms of defense presented by these bees. Researchers have suggested that there are significant differences in honey bee population dynamics in temperate and tropical climates, with a clear tendency for lower mite population growth under tropical conditions (De Jong et al. 1984; Eguaras et al. 1994; Garcia-Fernandez et al. 1995; Moretto et al. 1991; Rosenkranz et al. 2006, 2010). The island of Fernando de Noronha is located in tropical northeastern Brazil; consequently, the reduced temperature range among different seasons may place those bees under less thermal stress and population fluctuations. The Japanese mitotype of Varroa observed on the island is reported to be less virulent than the Korean type, currently ubiquitous in mainland Brazil, Europe, and North America (De Guzman and Rinderer 1999; Anderson and Trueman 2000; Strapazzon et al. 2009). Infestation with this less virulent strain of mites could contribute to ability of the host to bear high infestation rates with little damage or colony mortality. Correa-Marques et al. (2002) found that these bees were not more efficient than European bees when Fernando de Noronha queens were tested in Germany to head local colonies, also attaining high infestation levels and not surviving winter. In Germany, the Fernando de Noronha bees were challenged by the Korean strain of mites, though they also were confronted with high cross infestation from local colonies and with temperate climate conditions, after many generations in a tropical environment. The idea of local adaptation of both the parasites and the hosts is an important consideration to take into account. Meixner et al. (2015) reviewed some studies concerning Varroa-resistant populations of EHBs. Their compilation highlights that colonies descending from a specific survivor population, when tested outside their native environment, often succumb to Varroa infestation, reinforcing the conception that resistance traits are strongly influenced by genotype–environment interactions (Costa et al. 2012; Büchler et al. 2014; Meixner et al. 2014, 2015). It is plausible to suppose that the European bees on Fernando de Noronha are now only able to survive Varroa-haplotype J infestation under the tropical weather conditions found on the island. The reproductive success of Varroa in Brazil was relatively low in the 1980s (Ritter and De Jong 1984; De Jong 1984). This was originally considered an adaptation by AHB that helped explain how these bees survived Varroa infestations. Later, when Varroa reproduction rates in these bees increased to levels found in Europe (Corrêa-Marques et al. 2003), coincidentally with the changeover from the J to the K mitotype of Varroa (Anderson and Trueman 2000; Garrido et al. 2003), it became apparent that the low reproductive success by the mite was due to the type of mite and not the type of bee. This low reproductive success by the J mitotype on AHB contrasts strongly with the high reproductive success of Varroa that we found in the EHB colonies on Fernando de Noronha island, also infested with the J mitotype (Figure 2). The role played by pathogens is also unknown in this island population. Varroa is able to spread several viral diseases, weakening honey bees and eventually causing colony collapse (Genersch 2005; vanEngelsdorp et al. 2009). Deformed wing virus, which is strongly affected by Varroa infestation rates, is able to produce deformities in worker wings, turning those bees inviable for colony’s tasks as well as increasing mortality of those bees (Santillán-Galicia et al. 2008; Genersch and Aubert 2010). Varroa infestation can provoke immune suppression as well as enable the proliferation of pathogens (Yang and Cox-Foster 2005, 2007; Genersch and Aubert 2010). New studies focusing on the incidence of viruses and other pathogens in this population would be very valuable to help us understand the importance of the prevalence/diversity of pathogens on the survival of Varroa-infested colonies. From our data, it is not possible to specify the mechanisms that enable the coexistence of ectoparasite and host at high infestation rates. However, the data allow us to hypothesize about characteristics in these bees that may have contributed to this tolerance. Danka et al. (2013) asserts that methodologies used to quantify hygienic behavior (such as pin-killing and frozen brood) are effective for evaluating responses against more general causes of brood mortality (such as bacteria-infested brood). However, it is also clear that breeding bees using the methodologies to quantify hygienic behavior as selection parameters confers at least some ability to remove Varroa (Spivak 1996; Spivak and Gilliam 1998a, b; Ibrahim and Spivak 2006; Danka et al. 2013). The methodology used for hygienic behavior evaluation (pin-killed pupae) has been reported as less accurate than the freeze-killed method (Espinosa-Montaño et al. 2008), and for that reason comparison with data from other European populations, tested with the frozen-brood methodology, may not be adequate. Nevertheless, the high frequency of intense hygienic behavior in the colonies from Fernando de Noronha was very similar to the frequency of hygienic behavior rates found in AHB that we tested in southeast Brazil. African-derived honey bees are known for their multiple resistance traits, including hygienic behavior (Correa-Marques and De Jong 1998; Rosenkranz et al. 2010). In addition, Ribeirão Preto (hot subtropical) and Fernando de Noronha (mild tropical) present similar climate conditions, which can exclude a possible influence of climate conditions on the comparisons of hygienic behavior. Further studies will be required for any definitive statement concerning the role played by hygienic behavior in the Varroa tolerance observed in these European bees in Brazil. Regardless of the mechanism(s) involved, we can conclude that the EHBs on Fernando de Noronha Island have survived Varroa infestation without treatment for almost 30 years. We also conclude that these bees presented hygienic behavior frequencies very close to those AHB in southeastern Brazil. The mechanisms that enable the Fernando de Noronha bees to survive Varroa infestation merit further study. The authors are grateful to Fernando de Noronha beekeeper Lidia Albuquerque, the Secretaria do Meio Ambiente e Sustentabilidade do Estado de Pernambuco, the Programa de Pós Graduação em Genética, Faculdade de Medicina de Ribeirão Preto, Universidade de São Paulo, and the Conselho Nacional de Desenvolvimento Científico e Tecnológico (CNPq) for facilities, support, and assistance. We thank Dr. Michael Simone-Finstrom and reviewers for valuable comments.